Downloading dozens of images and videos from a web is a very repetitive task if we do it manually, this means, using "Save Image As...", that is why, to download large amounts of files from any site, the best option is to use PimpFish, a software application that takes care of this repetitive work for us. 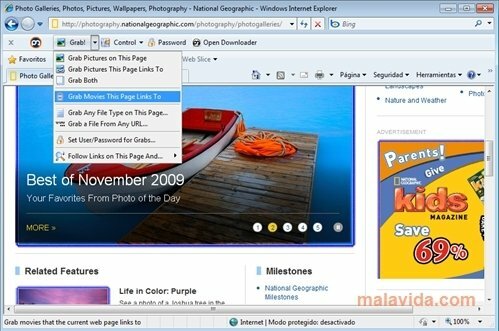 This download manager installs as a toolbar in Firefox and Internet Explorer, and when we see a gallery or file that we want to download, all that we have to do is click on the indicated button and hit Play, in a matter of seconds it will be downloaded. With this plug-in, downloading full galleries will be a matter of seconds and,of course, it will also download any video in Flash, Windows Media or Quicktime in just a few minutes (depending on its size). If we know where the file that we want to download is hosted, we can indicate the URL directly to save having to load the page. Furthermore, it is also capable of working in areas that are restricted by password, so by indicating the password, PimpFish will download any file without any problems.